Oh, happy day! 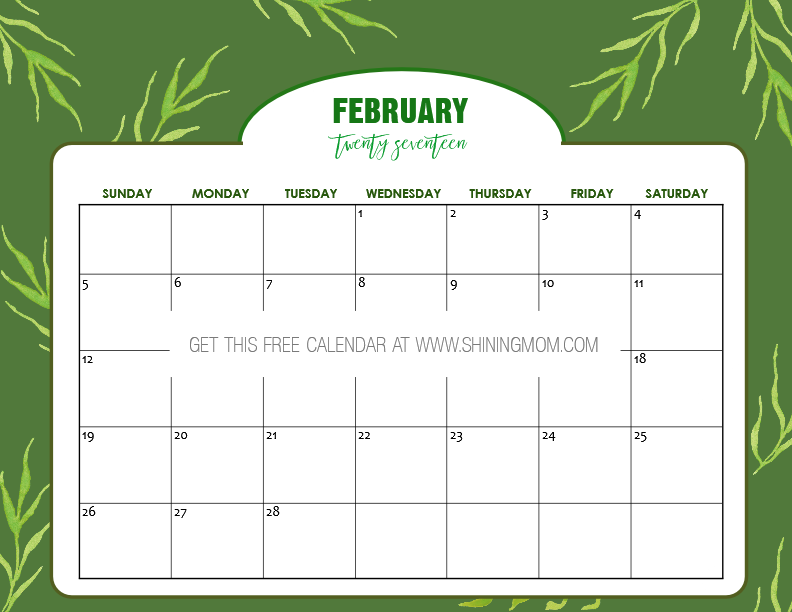 I am delighted to share with you your free printable February 2017 calendar. 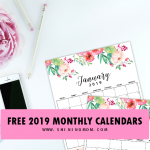 If you’re starting to look for a month-at-a-glance planner to use to map out the love month, you might like to stay with me for a while as I present to you the oh-so-lovely designs that I have for you . Scroll along, you might find something you like to use! 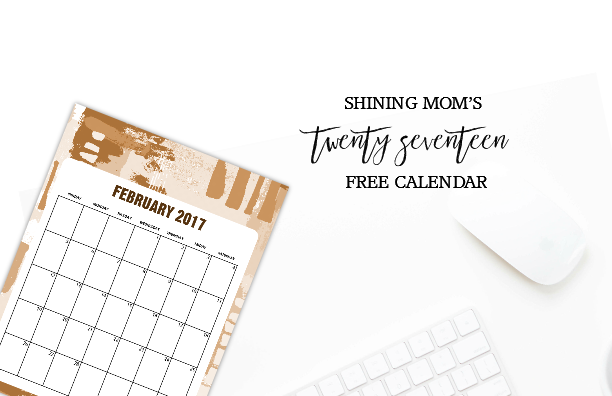 Snag a copy of Shining Mom’s free printable February 2017 calendar set. There are twelve designs to choose from! I made sure that your calendars for this month are special. 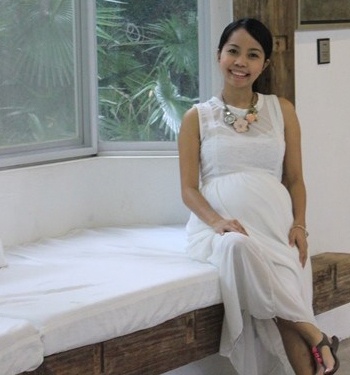 It’s the season of love and I believe several of you look forward to celebrate the month hence the darling designs. For this set, you can find Valentine themed calendars as well as some other classic and cute styles. Thanks to DesignCut for my artist toolkit, designing has never been this fun and easy! Enjoy these unique calendar designs (Some are even handmade in watercolor print)! 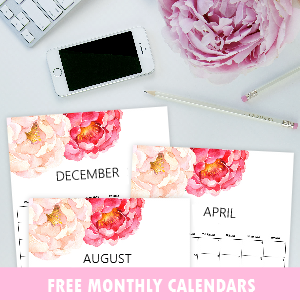 I am so, so excited to show these free February 2017 calendars to you! I really hope you can use them! Here they are! Let’s start with this bold calendar design that I truly love. If you’re just like me, I am pretty sure this is going to be one of your top options to use from this set. It’s Valentine themed, just perfect to use for the season. 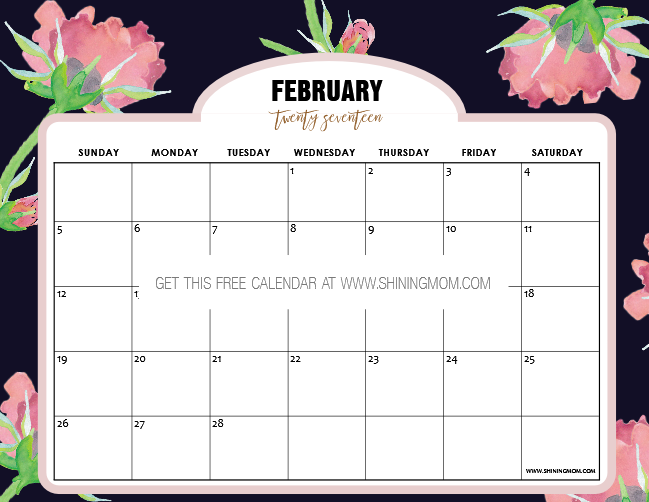 Adorned with hand painted flowers in charcoal gray background, this free printable February 2017 calendar is truly a stunning piece that would definitely inspire you to plan the month ahead! 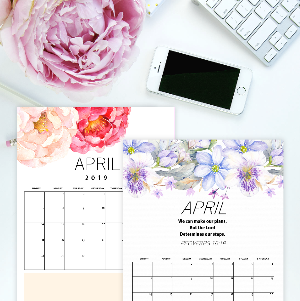 I love the simplicity of this next calendar, it comes in simple and clean fonts. But what’s darling about this piece is its watercolor background as it gives texture and statement to the design. 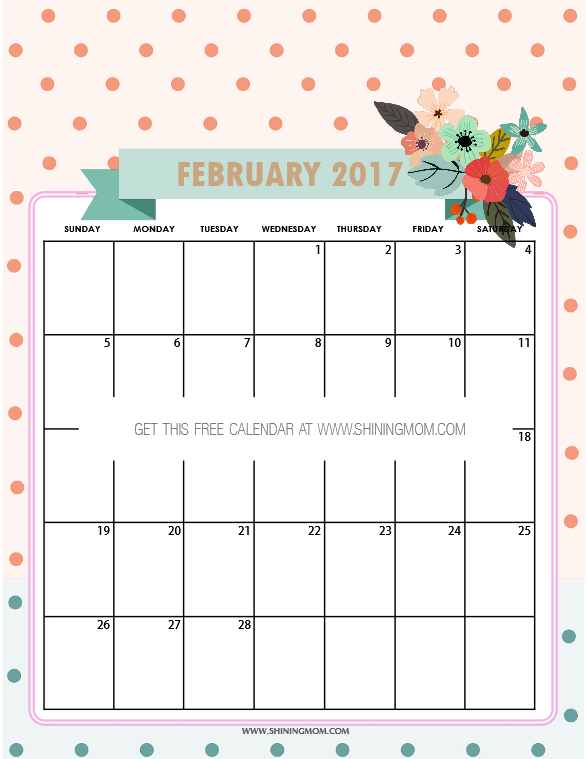 Do you like to use a simple calendar for February 2017? How about printing this one? 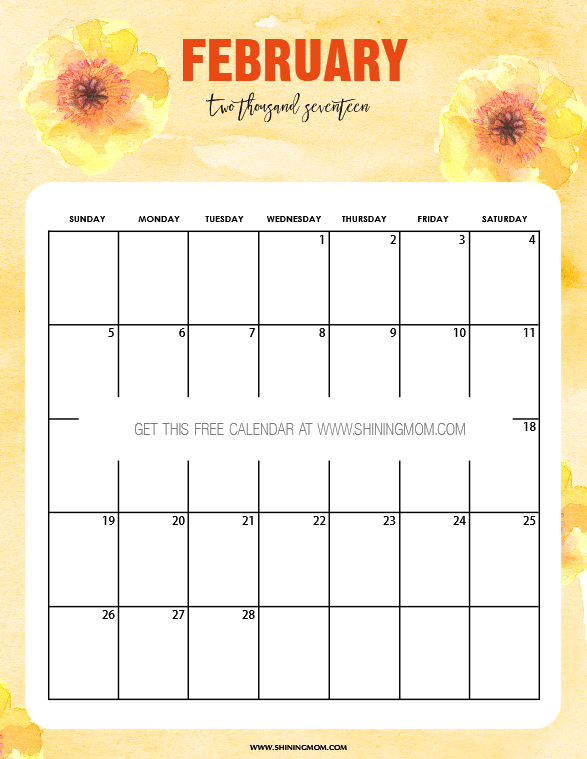 I like to give you several calendar options so the next one has a crafty look! Are you in the mood for this type? Cute and playful, this calendar also has a special area allotted for your personal notes and reminders. 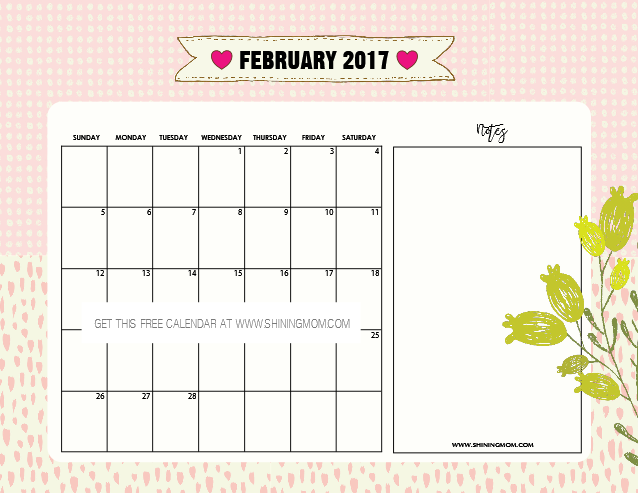 You can print this cute February 2017 calendar for yourself or for the little girls in your life. 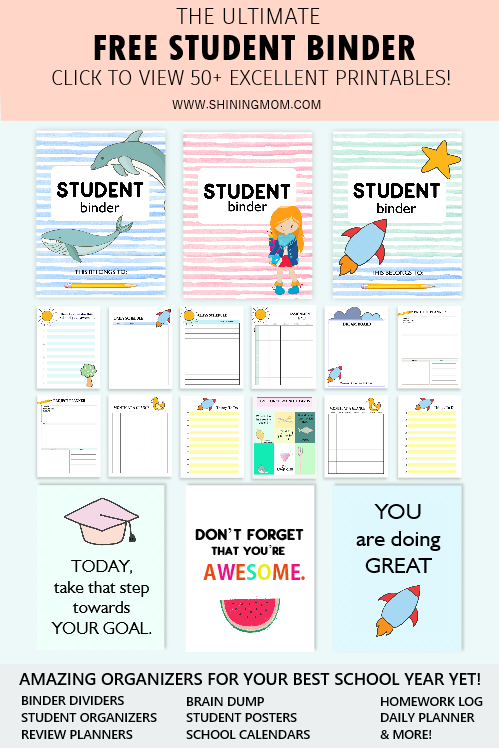 It will definitely make a great addition to their school binders! Since I know several of you are looking for a Valentine themed calendar to use for this month, here’s another design that you may opt to grab. It comes in blazing red background, just right to use for this season of love. It’s the season of hearts! This next calendar once again celebrates the month of February and it looks cheery in its burst of tiny hearts background. 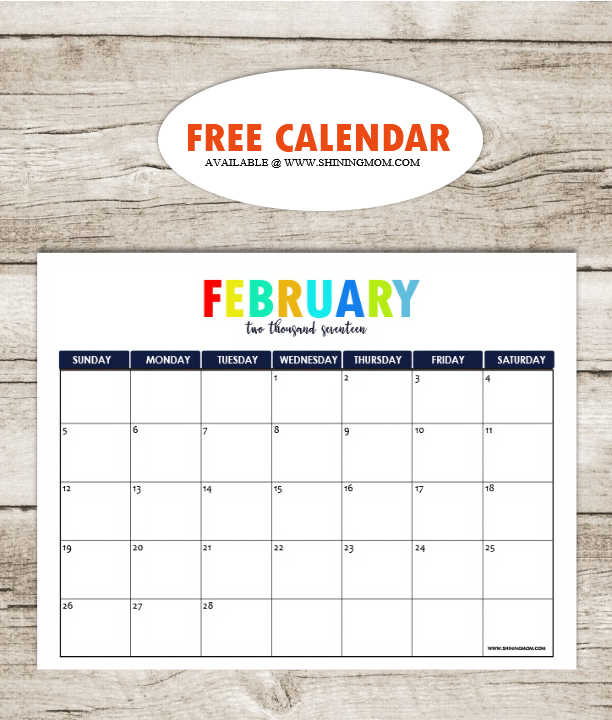 Kids might love to have this pretty calendar for February 2017 in their study area! Are you looking for a nature-inspired calendar to print? Here’s a refreshing design that you can use outright. 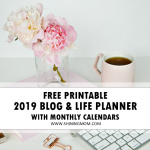 You can print this monthly calendar planner for your blogging, meal planning, etc.! This, I must say, is my hands down favorite from the set. I love the watercolor flower element that I have incorporated in the design, purchased from DesignCut. 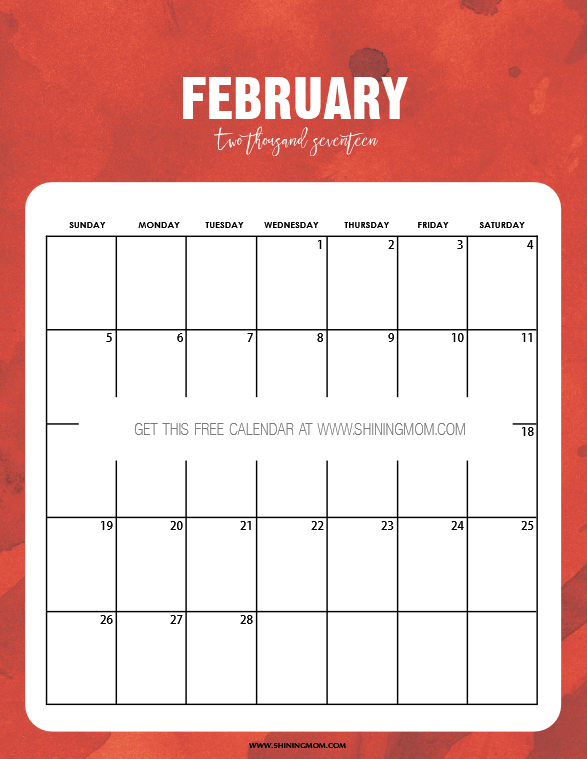 This free printable February 2017 calendar will sit perfectly on your work tables or even on your door fridge. 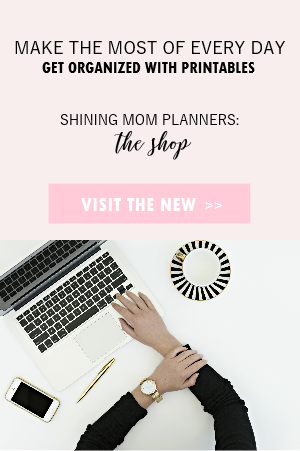 Have you seen the truly popular Shining Mom planner? Not yet? Better hop over here to view it. 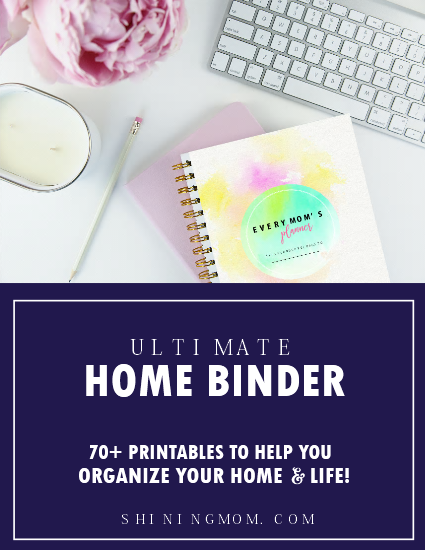 It’s designed to help you organize your days! And yes, this fun and colorful calendar matches perfectly with the planner. 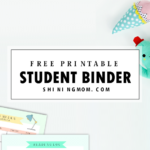 Be sure to snag your copies of these two freebies! This next piece is in neutral colors. Where do you think you can use it? 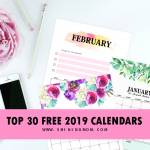 Looking for a no-frill calendar to use for your every day planning? 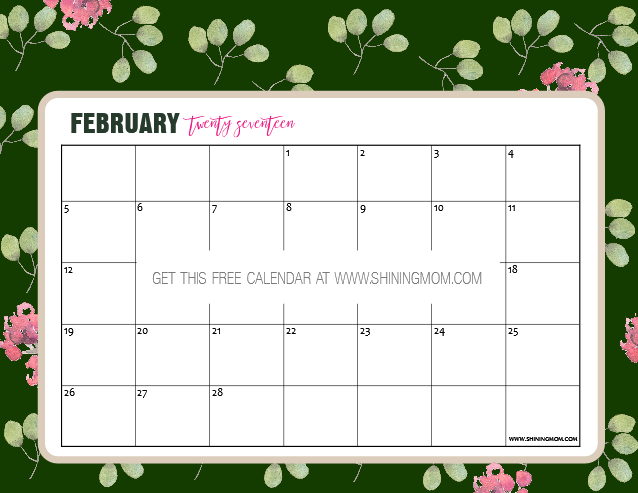 You might like to use this truly simple February 2017 calendar printable. 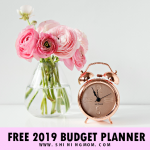 Pretty and understated, calendar is great to use wherever you wish! It’s pooping with fun colors, too, plus it is easy on ink! Loving green and pink? 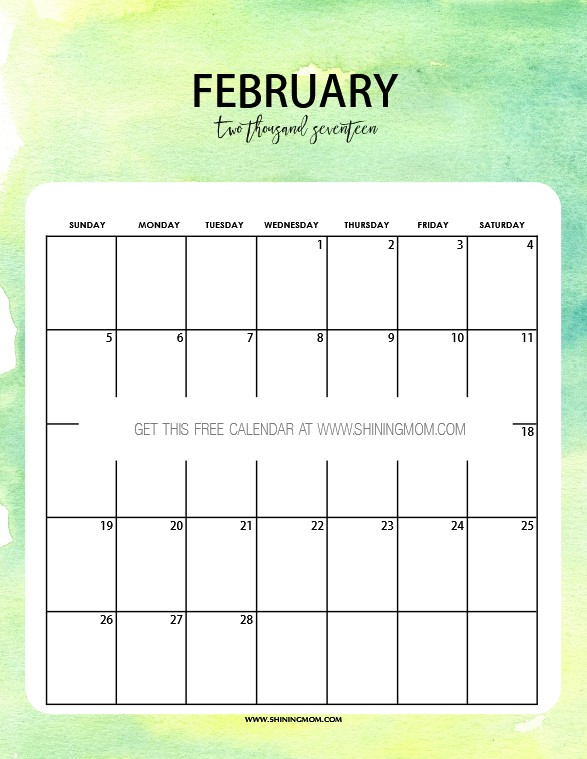 Here’s a truly elegant and beautiful February calendar design that you can immediately download and print. It’s definitely a unique piece! I would personally recommend that you use this pretty piece in your kitchen for meal planning! I am ending this calendar collection with this very dainty design. 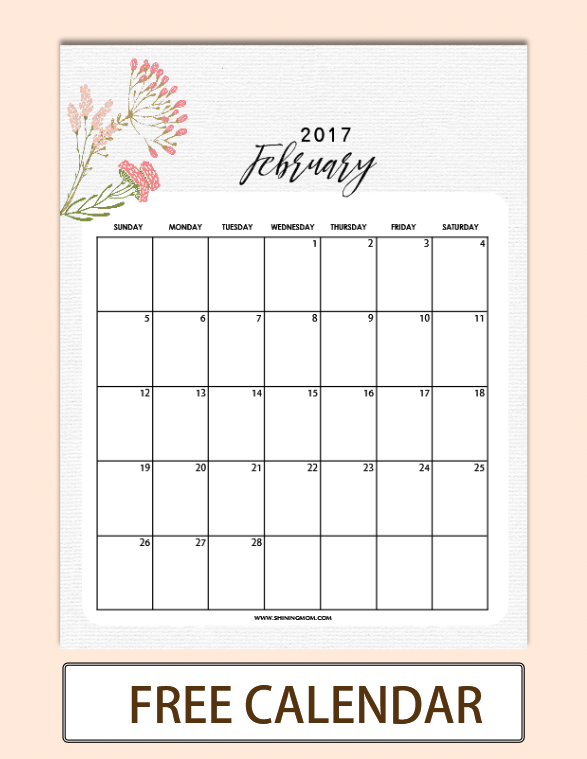 Simple, classy and elegant, you can definitely use this darling calendar to plan the full month of February 2017! It comes in textured paper background with a dab of hand-drawn flower elements! 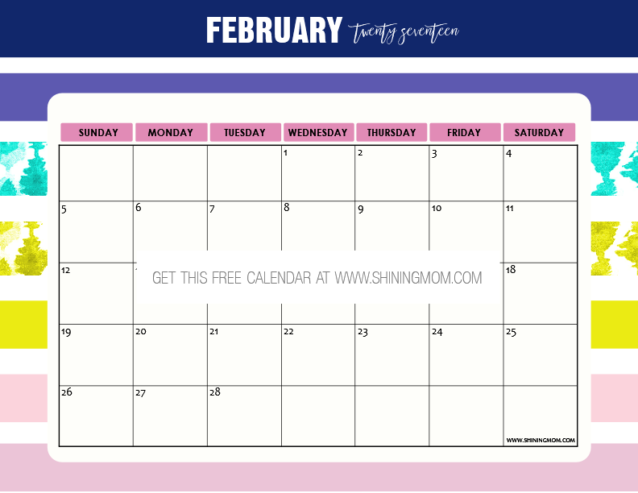 Free February calendars by Shining Mom! That’s it! 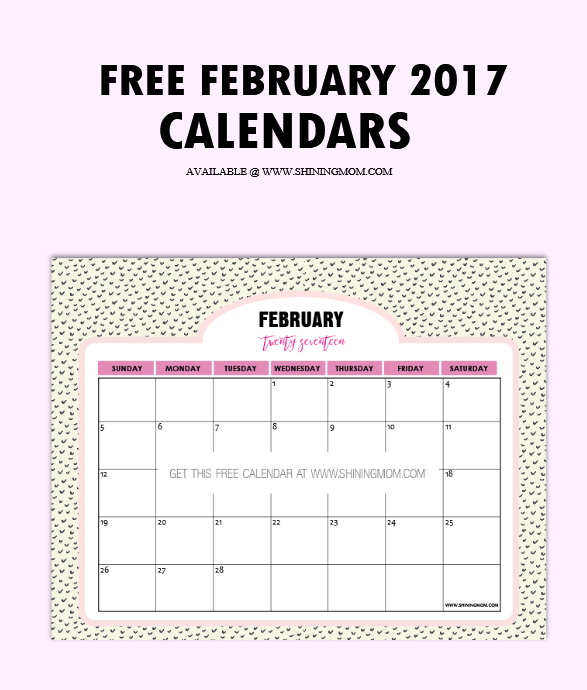 A dozen of free printable February 2017 calendars for you to choose from. Which designs do you think you’d love to print? Pick two or three for yourself and some copies for your family, officemates and friends! To make getting the copies easier for you, I have created two PDF Files, in landscape and portrait formats. Your lovely copies are HERE and HERE. By the way, I hope you can come back again for your March calendars! 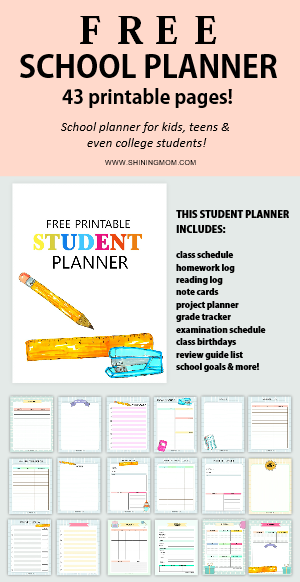 Yup, this is a monthly issue of Shining Mom! May your February be fun and productive! And oh, the calendars for March are out. Get them HERE! NOTE TO IMAGE SHARING SITES: ALL calendar previews posted here are strictly NOT allowed to be shared in your roundup post. 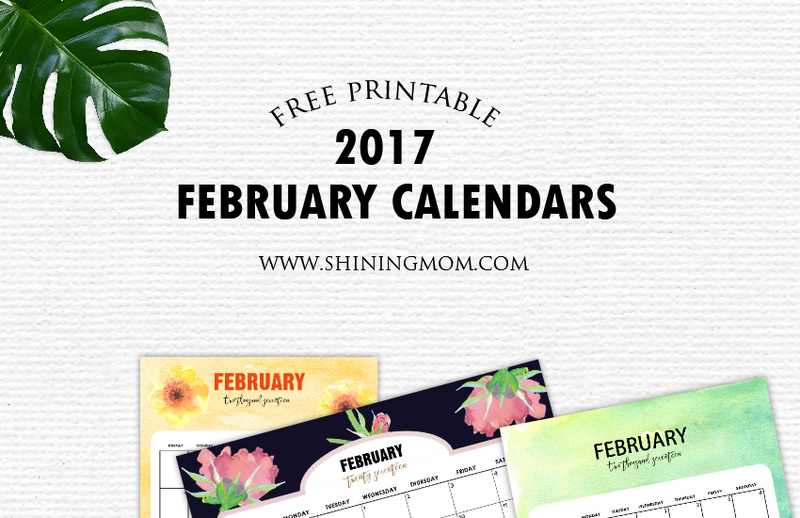 This set of free printable February 2017 calendars is copyright © www.ShiningMom.com and it’s free for personal use only! Pinning any of my images at Pinterest is very welcome and much appreciated!